Mycelial filaments beneath the skin of an instance of RPC-669-1. Containment Protocols: Given the nature of RPC-669 is incredibly difficult to contain, the Authority has prioritized the containment of entities created by RPC-669. Any living instances of RPC-669-1 are to be retrieved by Authority personal and brought to containment at Site-0071. Should a mass infection of RPC-669 in any animal population occur personnel are to enact Emergency Protocol 666-02. At least 2 security personnel are to monitor any instances of RPC-669-1 the Authority possesses in captivity. Under no circumstances should an instance of RPC-669-1 enter a functioning instance of RPC-669-A. Description: RPC-669 refers to a currently unidentified species of parasitic fungi of the genus Cordyceps2. Unlike other members of Cordyceps RPC-669 is primarily mammopathogenic, particularly it is preferential to rats and other small mammals as hosts. The anomalous properties of RPC-669 begin to manifest when a group of animals within the genus Rattus become infected. Researchers have separated the stages of RPC-669 infection, which are detailed below. 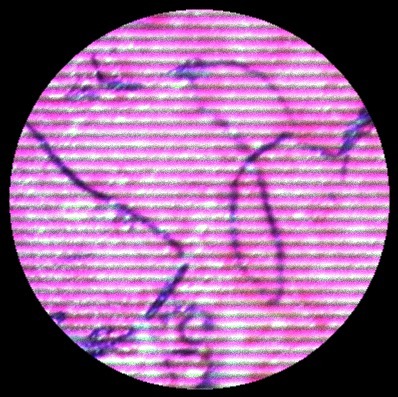 S1 Organism begins to show extreme discomfort. Vocalizations become strained and frantic. S2 Fibers reach the brain stem, subject ceases movement and enters a pseudo-catatonic state. S3 Movements resume as fibers permeate the organisms muscular system. S4 Subject's behavior appears to return to normal, subject has entered the later stages. S5 Subject begins to seek out other infected organisms. Becomes RPC-669-1 if successful. S6 Subject's health deteriorates as hallucinations begin. Will usually expire shortly after. It has been concluded through experimentation that the transfer of information between each organism within RPC-669-1 is facilitated by the knot of the subject's tails. As shown in experiment 09-3C, when a subject's tail is severed it no longer has access to information given to still connected subjects. How RPC-669 is able to form a system of intelligence within the infected organisms' tails is currently unknown. Method: Instance of RPC-669-1 is placed in a custom "roulette" container, with the central knot in the center and each individual specimen in an isolated cell on the wheel's edge. A specimen on one end will be shown which of three opaque containers contains food, and a specimen on the other side will be prompted to select a container. Results: The specimen prompted selected the correct container 100% of the time over several trials. Conclusion: Specimen contained within instances of RPC-669-1 are possibly able to transfer information between each other. Method: RPC-669-1 instance will be placed in the roulette device. One specimen will be shown a specific combination of button presses (using four colored buttons) that will result in the reward of food. The purpose of this is to clear any possible circumstantial factors for the success of Experiment 08-26A. Results: In every case, the second specimen perfectly replicates the combination, and is rewarded with food. Conclusion: It is certain that specimens contained within an instance of RPC-669-1 are able to transfer information between each other. Method: Two instances of RPC-669-1 (one which contains three Rattus rattus3 specimen and one with five) will be presented with a visual aid showing that food will be given when a puzzle cube is solved, and then presented with an unsolved puzzle cube. The test will be conducted several times daily, each time the cube will start in the same unsolved position. Results: The first instance if RPC-669-1 (three rats) usually took roughly three hours to complete the puzzle, this time staying constant as the days continued. 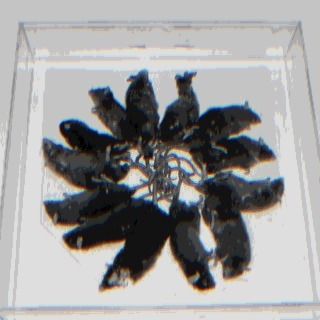 The second instance (five rats) took three hours the first few days, however as the days continued the time taken by the second instance steadily decreased as it began to recognize the cube's starting position and recall methods previously used. Conclusion: Instances of RPC-669-1 become significantly more intelligent as the number of specimen contained increases. Method: Researchers attempt to untangle to the tail knot of an RPC-669-1 instance and separate the specimen. Result: After several hours researchers are unable to untangle the RPC-669-1 instance. Method: A model of an RPC-669-1 tail knot is provided to a neural network with the instruction to formulate a method to separate the contained specimen with a minimum number of steps. Result: After several million iterations the computer returns a method with 231 steps. Method is followed exactly by researchers but separation is unsuccessful. Method: A single instance of Rattus norvegicus4 will be removed from an instance of RPC-669-1 via the severing of the tail. RPC-669-1 will be presented with a diagram showing the location of food in three opaque containers. The severed subject will then be presented with the containers to test its knowledge. Results: Severed subject only selected the correct container about 32% of the time, consistent with random chance. Conclusion: Physical connection to the tail knot is required for the transfer of information. Methods: Several instances of RPC-669-1 are placed in a container devoid of any external stimuli and observed for an extended period of time. Results: After a few hours, all instances eventually began to act erratically. Often the instance would begin to act incredibly defensively towards one corner of the container, as if a threat was present. At other points, instances will periodically attempt to escape the container by erratically clawing at the walls. Researchers have likened this behavior to attempting to run away from a threat. Conclusion: Instances of RPC-669-1 consistently experience violent hallucinations. Method: To ascertain the nature of the hallucinations that RPC-669-1 instances experience, a control will be recorded, followed by two tests wherein RPC-669-1's visual and auditory capacities will be hindered. Results: RPC-669-1 responded in nearly the same manner as in the control in the hearing impaired test and the eyesight impaired test. Conclusion: Hallucinations experienced by RPC-669-1 instances are both visual and auditory, or exist in some other manner that does not require working sensory organs to experience. THE FOLLOWING ADDENDA CONTAIN SENSITIVE INFORMATION. MEMETIC SCREENING IS REQUIRED TO PROCEED. 2. A genus of fungus which is typically entemopathogenic.